Reigate weekend in brief: Saturday dry (but v wet North England: low risk of it extending our way); Sunday wet; Monday showers NE wind. Update: forecast for weekend proved v tricky: Model rainfall forecasts struggled with the easterly cut off low set-up. Saturday was pleasant and Sunday turned out dry and warm. 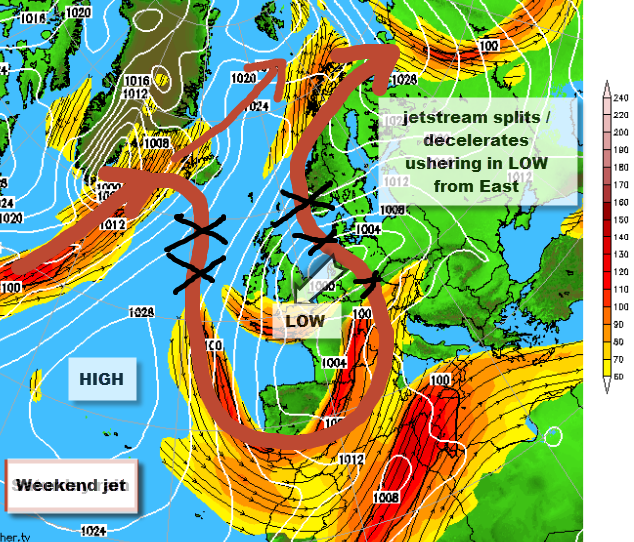 Note: GFS rainfall seems not to cope well with meridional jet stream with cut-off low over UK scenario! Wondering if the weather is a bit odd recently? Well, you may have it right… the weather is literally upside-down from what we would normally expect in the UK. We would normally expect LOW pressure systems to whizz over the country from west to east. Temperature normally decreases further north and we usually expect warm air to arrive from the south. This weekend turns this normal expectation upside-down! A WARM air mass is pressing down from the NE, having arrived on a long journey from the Mediterranean and Eastern Europe (where there is a heatwave). This warm air is due to meet the COOL polar air hovering over the UK and cause torrential rain over Saturday up North. Reigate will see none of this and will stay mostly dry on Saturday. On Sunday, however, cooler air will push up from the South and cause heavy rain for the SE and Reigate. Warm air from the North? Cool air from the South? Slightly unusual. 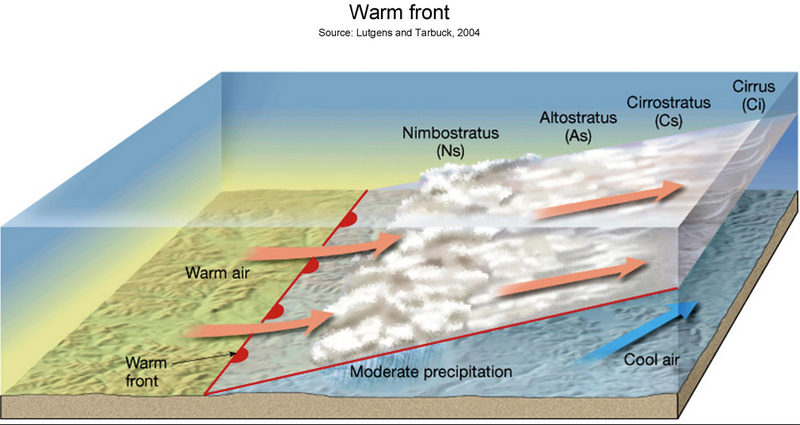 Where air masses of different temperatures meet the warmer air is forced to rise up and over the cool: a front. The greater the difference in temperature between the air masses and the steeper the temperature gradient, the greater the uplift. This causes condensation, clouds and rain. Fronts usually approach the UK from the West. Currently a huge HIGH pressure is blocking all westerly winds. A warm front moving south from across the North Sea is most unusual! The cause of all this is the development of a cut-off LOW over Europe. A very looping jetsream (meridional) has been drawing polar air down across the UK this week and this cold air has pooled up over Western Europe, hence all the convection and showers. Meanwhile, the northward moving limb of the jetstream has been dragging warm air up over Eastern Europe (which has a heatwave). This warm air is due to meet the cool air over the UK this weekend. The good news is that Reigate is likely to have a reasonable Saturday out of all this. Sunday could be pretty wet though. The cut-off LOW will hang around for early next week and the unsettled theme continues for us in Reigate until the end of next week when things could improve for Bank Holiday as HIGH pressure builds in from the Atlantic. This means the west and north are likely to see better weather than the SE for Bank Holiday, but that’s a long way off to be certain. Keep tuned!